I like to refresh a lot of aspects of my life with the new year – including my homeware. I’m lucky in the fact I currently have two homes I can refresh – both my University home here in Norwich and my home-home back in Ipswich! It’s so nice to freshen things up once in a while, and a homeware makeover doesn’t mean forking out hundreds of pounds – sometimes it can simply be the case of switching up the prints in your frames, or adding a fresh bunch of flowers to your room. Despite not owning my very own home to freshen up (one day! 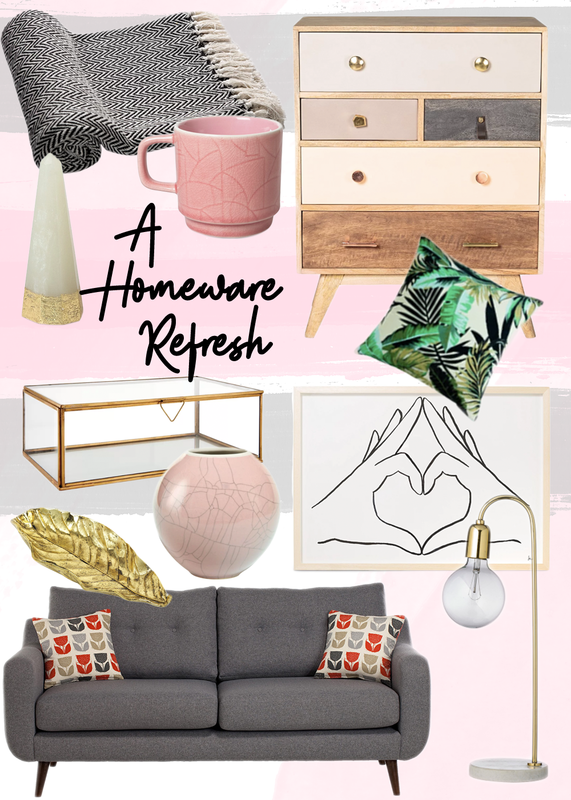 ), a girl can still dream, so I’ve put together a wishlist of the best homeware picks I found right now. I’m loving the accidental pink/grey vibe I managed to put together in this collage. I’m actually going for this colour scheme in my room right now. Obviously it wouldn’t be a wishlist without something marble – this Table Lamp is so me, although I do already have a very similar rose gold one I got from Aldi a while back which you can see here. A new sofa is certainly an investment and not something I’d plan on doing every year (every decade or two more like! ), but I couldn’t help but notice some absolutely gorgeous ones online – I will definitely be a fabric sofa girl in my first home. A new piece of art is the perfect way to revamp and refresh a room for the new year, and I absolutely adore this Heart Hands Wall Art – so simple but so gorgeous! The Chest of Drawers though, have got to be my favourite pick of the lot. I cannot wait to have my own home one day to deck out with quirky pieces of furniture such as this. It would be so perfect in my bedroom if there was space for it!! How are you refreshing your home for the new year? "5 Bloggers to watch in 2018"
"A New Perfume for the New Year: Black Opium by YSL"